What is it? It’s a good question, since the name is far from appealing, and tucked away as it is in the long list of cornmeal-related breads in Bill Neal’s excellent Southern Cooking book from North Carolina. Essentially, you mix 200g cornmeal with 200g water and a pinch of salt, then drop it in tablespoons into hot fat and fry it til crisp. My cast iron biscuit pan was ideal for making perfect rounds. 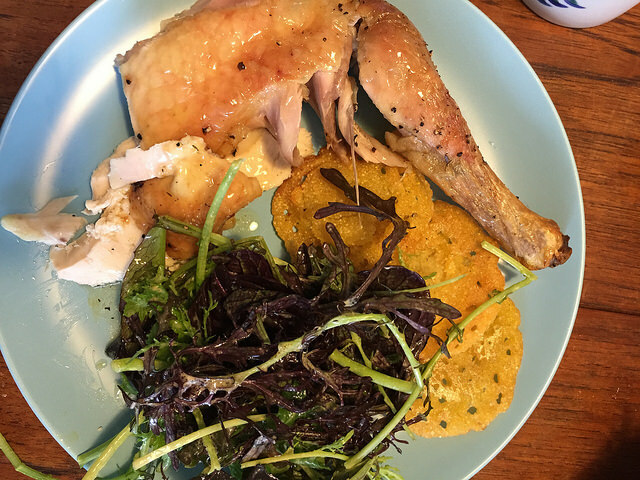 We used the fat we skimmed off from the pan juices of our roast chicken, and it was incredible. Like a cross between crisps and roast potatoes, or deep fried crumpets? But way easier to produce than either of those. If you’re not worried about heart disease, and can’t be bothered to make roasties with your next Sunday roast, I recommend. Keep up with the latest on Junior's Table—follow me on Twitter, check out the page on Facebook, and sign up for email updates. A place to hang out and explore Proustian moments in food and cooking.